As Kermit the Frog says, it’s not easy being green. However, we all need to contribute to protecting the future of our planet. Air travel produces more carbon that any other method of transportation, but there are things you can do to minimize your carbon footprint and/or offset it. These things don’t take a lot of effort or sacrifice and you will still have a wonderful, relaxing (and guilt-free) vacation. 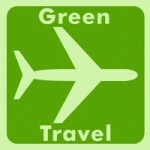 Here are a few tips that will help you be a little more eco friendly on your next trip. There are many things you can do to conserve energy before you even leave home. Unplug all of the appliances, even the television and the surge protector. They can use up to 40 watts of electricity per hour even when they are off. Turn your heat and water heater way down or your air-conditioning off. Make sure you put energy efficient light bulbs in any lamps you have on timers. Stop your newspaper delivery or donate it to a school in the area. When booking your flight, save a tree and request an e-ticket. Try to get a direct flight instead of one that makes multiple stops and don’t fly first class. First class seats take up twice as much space. Fly during the day, as studies have shown that daytime flights produce fewer carbon emissions. Use the plastic nametags that came with your luggage. The paper ones the airlines give out create unnecessary waste. Speaking of luggage, pack lightly because the heavier the plane, the more fuel it will use. If you buy a magazine or snacks in the airport, refuse the plastic bag and put your purchases in your carry-on. When you check-in, let management know that it is not necessary for them to change your sheets and towels every day. Always turn off the lights, T.V. and air-conditioning when you leave the room. Try using natural light by opening the curtains. If you plan to use the hotels’ toilerettes, don’t carry your own. At meals, especially buffets, take small amounts of food so that nothing is wasted. You can always go back for more. When checking-out, save another tree and ask for paperless billing. Use a digital camera with rechargeable batteries. This way you won’t use film and you can reuse the batteries many times. Walk places. This will also help burn some of those extra calories you are consuming. If you cannot walk, take public transportation instead of renting a car. If you must rent a car, rent a hybrid or a smart car. Take a volunteer vacation. You may end up somewhere you never imagined helping with local education or to construct a drinkable water source. This is a reduction in carbon emissions which is funded by a person or organization to lessen or erase their carbon footprint. Many companies, bands and celebrities are carbon neutral due to these offsets which include planting trees and producing renewable energy sources.